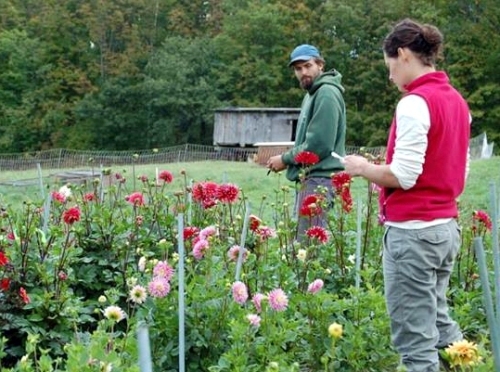 About a third of our dahlias are now being grown for us by Craig and Megan Jensen of Sun Moon Farm in New Hampshire. 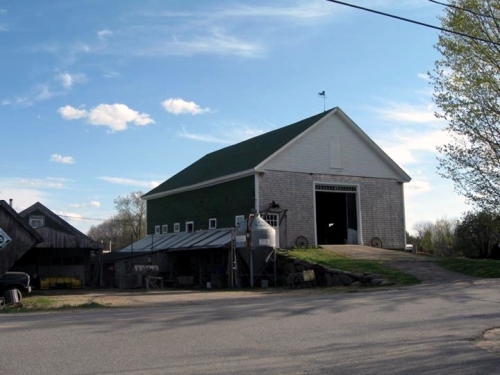 Although the small CSA (community supported agriculture) farm is only a couple of years old, the land it’s on has been continuously farmed since the late 1700s. 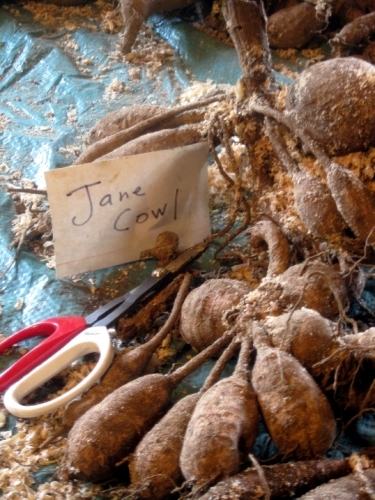 Until recently it was also the campus of The Meeting School, a small Quaker boarding school that made farming a cornerstone of its experiential learning. When the school closed in 2011, five young faculty members — including Craig and Megan, who were married there that fall — stayed on and eventually bought the property, closing on it in December 2013. Sun Moon’s big shingled barn was built in the early 1800s. variegated ‘Gipsy Girl’ (coming soon) on the left. lover. Dahlia-growing runs in Craig’s family, too, Ann told us, and the couple were already growing a field full of dahlias to include in their weekly CSA (community supported agriculture) shares. 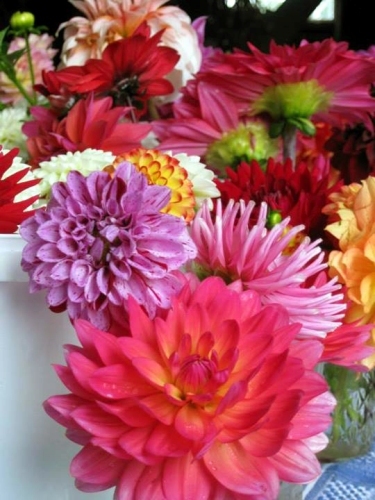 We talked, they came to visit, we hit it off, and most importantly we were convinced they knew what they were doing and our dahlias would be in good hands at Sun Moon Farm. 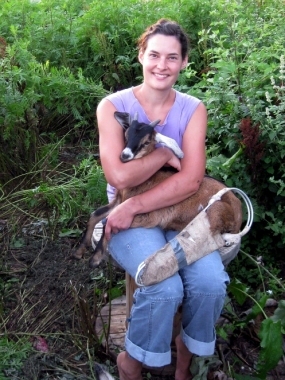 Learn more at Sun Moon Farm’s Facebook page and in the Monadnock Ledger-Transcript. as Craig knows, farming is never easy. 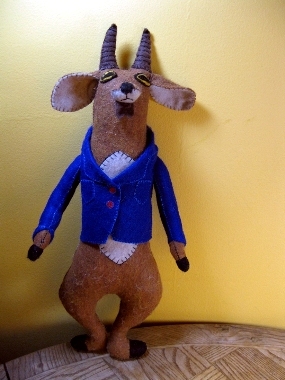 sews dolls like this one of Whistlejacket. (whose broken leg is now healed). ‘Jane Cowl’, ready to be divided. 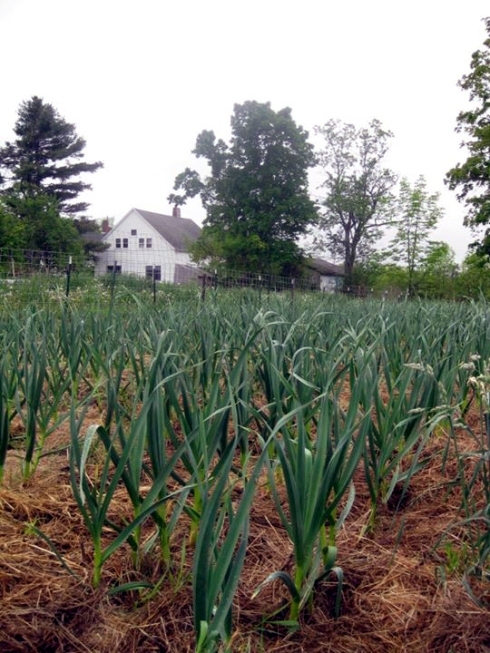 Well-mulched garlic with one of the farm’s old houses in back.